A difficult narrow and steeply sloping small lot has been transformed into a modern inner city residence making full use of panoramic city views, while still respecting its neighbourhood and streetscape. Built over three levels to deal with the slope, the home is topped out with a glazed living 'pavilion' and entertainers terrace that is reminiscent of loft style living. 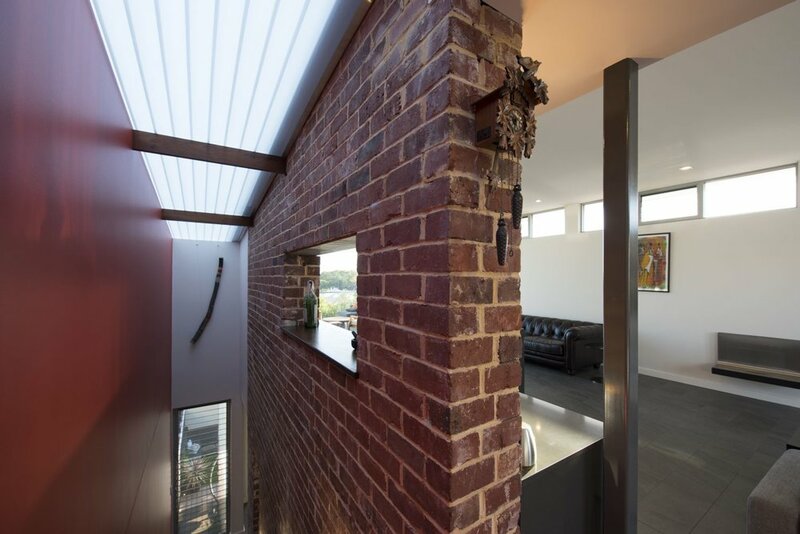 The three levels are linked by a floating stair of jarrah treads built off a soaring recycled brick feature wall that acts as a heat sink for the home. A tri-walled clear skylight over the stair floods the home with light from above. The home uses composite construction of both lightweight and traditional materials that ensures the most economic and low carbon footprint solution. The home has a high sustainability agenda with a 6KW photovoltaic system, 3000 litre rainwater tank, LED lights and Haiku fans in lieu of air conditioning.